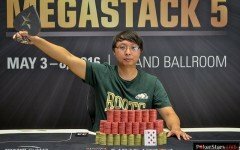 The Macau Poker Cup (MPC) Red Dragon Main Event is finally finished with Alan Lau standing victorious above a record breaking field of 1,216 players. The MPC has been running from February 3-19, 2017 at the PokerStars Live Macau at the City of Dreams featuring the Red Dragon Main event which has a buyin of HK$15,000. Being the largest freezeout in Asia due to its massive participation, the event has a whopping prize pool of HK$15,923,520 (approx. US$2 Million) which has gone beyond its original guarantee of HK$10 Million. Alan Lau from Hong Kong, who was the 2015 Asia Player of the Year in a controversial point count, has once again placed himself at the top of the leaderboard with his win of the HK$10,000 NLH Event 2 for HK$261,900 ($33,744) and now the Red Dragon Main Event for an impressive HK$3,265,000 ($420,674). He went heads-up against Chien Fa Chou from Taiwan who was the chip leader entering the Final table. The final table was dominated by a lot of new faces. But apart from Alan Lau, there were 2 other veteran players and that were Global Poker Index (GPI) Player of the Year 2016 Yang Zhang and 2017 Aussie Millions 10th placer Bobby Zhang. Yang Zhang ended up in 4th taking home HK$840,000 and Bobby Zhang made 7th place for HK$348,000.